'Laced Handkerchief' (Anna and David Cadd, R. 2005). Seedling #87-93-22. BB, 27" (69 cm), Midseason bloom. Standards and style arms deep golden yellow with pinkish cast; falls deep creamy yellow, gold border; beards yellow; very laced and ruffled; slight sweet fragrance. 'Newlywed' X 'Passion Flower'. Cadd 2005. From AIS Bulletin #337 April 2005 Introducing Laced Handkerchief: (Cadds 2005). BB. 27" (68 cm.). Mid. Standards are deep gold yellow with pinkish cast; Style arms are gold yellow. Falls are deep creamy yellow with gold border. Yellow beards. Extremely ruffled and laced with 5-7 buds and very nice. 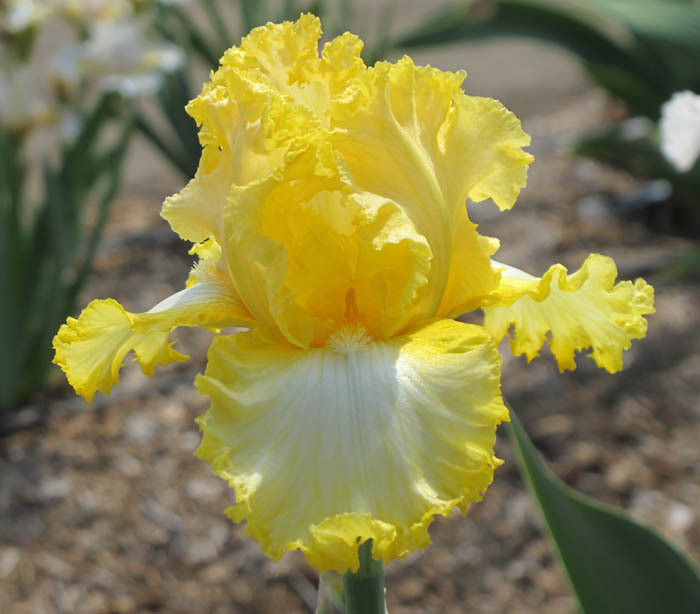 The one medium size iris to remember! Newlywed x Passion Flower. Sdlg: 87-93-22 (received EC in 2004 in Santa Rosa). $15.00. Cadd's Beehive Iris Garden.